by Ward L. Kaiser, published by the New Internationalist and ODT Maps, 2012. Anyone looking to develop a new class or training program to improve intercultural competence? 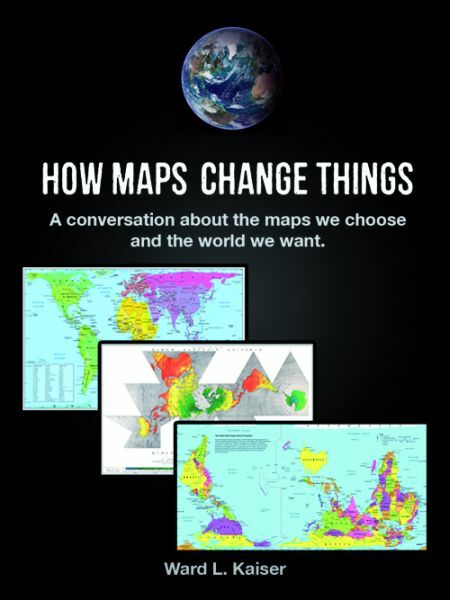 This just-released book, How Maps Change Things: A conversation about the maps we choose and the world we want, could be the basis of one terrific learning journey! I highlighted something on nearly every one of its 188 pages. I learned so much, on so many different yet related topics, that I now have five or six threads of learning and discovery I want to pursue! So you start to hope that How Maps Change Things could teach us to be careful whether we label a certain body of water the “Arabian Gulf” or the “Persian Gulf,” or color-code parts of Kashmir as Indian or Pakistani, but it goes way beyond that. For these reasons and others this volume will be useful to interculturalists and those interested in diversity, sustainability, and social action. The author premises that maps are tools that serve a purpose. To illustrate this point he shares some terrific stories: one about the role of maps in a territorial dispute between First Nations people and the Canadian government (pages 35-39); another about how a map can skew our view of a country as a source of oil or as a residence of people and families (pages 8-17); and a third showing how a map was used to get one county to pay for a highway interchange that served another county (pages 34-35). There is a chapter about the connection between maps and faith/values (chapter 10 page 141), and how maps are used for disease control and health (page 170), as well as for crime prevention (page 173), a topic of special interest lately with concerns of profiling and ethnic bias. The book is written in a lively, accessible style, though it gets heavier and slower toward the end; ironically, the final chapters are where Mr. Kaiser’s true passion seems to lie. It contains several embedded learning exercises (e.g., page 121) and interesting conversations such as how indigenous North Americans mapped (page 40). Via this latter conversation, he shows that the “culture” of map-makers is not universal. This, to me, is a hugely important point. Too many people believe their area of professional practice is culture-neutral or universal when, in fact, even science is culturally relative (as well as discipline-relative!). One of the pleasures of reading How Maps Change Things is that it contains quite a few valuable “hidden” gems. One of my favorites: as the author discusses the huge socio-economic gap in our world, variously referred to by such inadequate (or judgment-laden) terms as North-South, 1st/3rd world, Developed/Developing nations, and Viable/Failed states, he provides in the footnotes a list of experts from diverse political persuasions and walks of life who share a consensus on the absolute need to bridge this gap (pages 138-139). Through March 31 our friends at ODT Maps, the publisher, are offering this ebook FREE to our Cultural Detective community. I urge you to take advantage of this offer and help the author get this book put to good use! Maps are tools, and can be purposed to perpetuate bias or to help us to create a better world. Cultural Detective has long been passionate about maps as learning tools. Way back in December of 2005 we dedicated an entire edition of our Cultural Detective e-news to maps (including 3 articles of activities and curricular ideas and a quiz), relying in large part on the expertise and generosity of our friends at ODT Maps. It included: Using Physical Maps to Transform Mental Maps; 8 Map Activities for Intercultural Learning; a World Map Detective quiz; Training with Map Power; and a free offer (a Mecca-centered Azimuthal map, a Peters Projection map, and a Population Map) from our friends at ODT Maps. Bob Abramms at ODT has a wealth of books, DVDs, globes, puzzles, games, props, and world maps for different purposes — terrific training material for intercultural and global diversity and inclusion professionals. If you’re not familiar with his great stuff, be sure to check it out. This entry was posted in Book reviews, Downloads/free gift, Training and coaching tool reviews and tagged Cross-cultural, Cross-cultural communication, cross-cultural skills, Cultural Detective, current events from an intercultural perspective, diversity and inclusion, Education, Education and Training, First Nations, Gall–Peters projection, global diversity, intercultural competence, Learning, Map, Media literacy, Mercator, New Internationalist, Persian Gulf, Peters, social justice, stereotypes, Sustainable Development by Dianne Hofner Saphiere. Bookmark the permalink. Thanks, Dianne. Sounds like wonderful resource. I remember the power of a map back 20+ years ago when I first attended the Summer Institute and took Jack Condon’s wonderful intro class. He held up a Japanese-made world map and completely shook my unconscious assumptions of my “place in the world” without even saying a word. Jack has a way of doing that, doesn’t he? All good teachers do. 😉 Thank you for sharing that experience with us, Anna. Jack was very involved in the very early stages of this Cultural Detective project, and of course has been a very formative influence on my intercultural understanding. Thank you Dianne for this great book review whichn I thoroughly enjoyed. i certainly intend to use it with students . I am so glad to know you found it helpful, Eliane. THANK YOU for working with students!!!! They are our future, I know it’s cliché, but so happy to know we have many in the Cultural Detective community who work with youth to build respect, understanding and collaboration skills. Thank you. This is a fascinating topic. It’s interesting how widespread the mistaken assumption is that the maps people use accurately portray the world and the people in it. Maps have A use, they quickly become problematic when the use is exntended. Thank you for your comment, Mike! It is indeed fascinating how we are so cautious about the tools we use in some arenas, but maps we somehow take for granted, not thinking about the purpose for which they were designed. The idea that this gets inside our head and forms our view of the world around us, that is scary stuff! Great review. Reminds me of one of my favorite books, “How to Lie with Maps” by Mark Monmonier. Good read for anyone interested. Thank you for the kind words and for the book recommendation, Gina. It looks interesting: nice, short, engaging. I’m laughing because when I first read the book’s title, I imagined lying down with maps! lol Now I see that it is telling lies with maps. Guess my mind needs to get out of bed this morning! Thanks for the reference, Dianne. The thought that came to my mind (before reading the book, just based on your review) is how this might be applied to stakeholder maps, networking maps, internal organizational maps. I will definitely go get this one!